Gena Raps: You’re not only a pianist. GR: How did that happen? MLT: Wait, wait. Let me finish the list of inventory. Then I became a toy instrumentalist and then I became an occasional vocalist. I discovered I could use my voice about 15 years ago. I didn’t know I had a voice until I discovered it while working on George Crumb’s music. His music requires a pianist to be more than only a pianist. You have to be a percussionist, a vocalist, and a string player since you’re playing on the strings as well. And somewhat of an actor, because it’s very theatrical. That’s when I discovered I had a voice. Then, people started writing for my voice. I am delighted to have this extra dimension that I can incorporate. I’m also a performance artist. GR: When did you start playing toy pianos? Lincoln Center had a memorial tribute for him. It was during a summer festival called Serious Fun, and they asked me to perform. I decided to do a program that would encompass the various pianos that John Cage wrote for, to show the amazing diversity of his creativity, even within just one instrument. There was piano, prepared piano, string piano, bowed piano, and toy piano. GR: He had written for toy piano before you knew him? GR: How many octaves is it? MLT: Nine consecutive notes, from E to the octave E and one more note, F, and only white notes. You can even do it, theoretically, on one of those with painted black keys – you know, Schroeder-type – but the creativity was amazing. All these intricate rhythms, double notes and permutations. John Cage really meant whoever was playing this to take it very seriously, because he notated with such detail of articulation, dynamics, which of course you cannot really achieve on a toy piano. But if he hadn’t put in dynamics from PP – PPP to FFF – … you wouldn’t even try. In the act of trying, something happens. He was brilliant. GR: When did you discover the Suite? MLT: After John died, unfortunately. Because I wanted to play on all the different kinds of pianos that Cage wrote for, I went to dig out the Suite for Toy Piano. I had never looked at it when he was alive. I regret that. I hadn’t played the Suite for Toy Piano even though I worked with him for eleven years; we were working on the big piano but this is really only a little ditty of a piece. GR: When did you realize that you were interested in the most avant-garde forms? MLT: In 1993, when I decided I would include the Suite for Toy Piano. And that opened a whole…Pandora’s box of possibilities. I thought, if I have to spend this much time to make this piece sound like a real piece of music…I do believe then that the toy piano has the potential to become a real instrument. A real instrument! And that was the catalyst that set me on this path. As you know, I’m classically trained. I’m the first woman to graduate with a doctorate from Juilliard. After that, what do you do? GR: You walk the plank, as they say. MLT: That’s the thing: Juilliard never, in those days – I don’t know about now – never, ever prepared you for the real world outside. You lived in a goldfish bowl. GR: There was an uprising eventually. Many alumni came back and criticized the lack of policy to help graduates. Doctors come out of medical school and they have a path; their schools help them. There’s a process to place graduates. GR: You know what Juilliard’s response was? They accept fewer pianists. MLT: I guess they expect you to find your own way. As a result…I…didn’t quite know what to do with myself for work. I gave a few concerts, I taught a bit. But that wasn’t what I really wanted to do with my life. And I was getting restless. I decided to go to my next love, which was dogs. I went to the dogs. Literally. I decided I wanted to be a dog trainer for the blind or the handicapped. And just dump the whole piano business. And I did. GR: Discouraging after all that hard work. MLT: Not really, if you find something else that really engages you. GR: I know, but you trained so hard to be at Juilliard. MLT: Ah, but I didn’t give it up entirely, because I had a few concerts that were still booked, which I had to play even though I was already much more interested in dog training. I was going on a tour of Asia and I thought, I don’t want just to do another program of the regular classical composers. I want to do a program that’s more challenging and actually would show Asian audiences the impact of their culture on Western composers. I made a program showing the influence of Asia on Western composers, starting with Debussy, all the way up to Cage. MLT: I did do The Snows of Fujiyama as an encore. That’s pentatonic and it was a nice encore. That was my token to Cowell. In making this decision, I discovered the prepared piano music of Cage. This is where it all started to turn around. I’d been a dog trainer for a year, training dogs for the deaf, which I thought was a very good thing. At that point, I started getting interested in the piano again, because I was beginning to discover all this other music. The prepared piano of Cage really fascinated me because it’s so gamelan-like. I really think there is such a thing as destiny and fate. I had a friend, Marion, a dancer, staying with me at that time from Malaysia. She started spontaneously choreographing to the music of Cage and Hovhaness. And me, in my typical fools-rush-in-where-angels-fear-to-tread mindset, decided that John Cage should see this. But I couldn’t find a place to do it for him. Then fortuitously I met [Juilliard] Dean Gideon Waldrop on the bus, on the Riverside bus, going downtown. I hadn’t seen him in a while because I’d graduated by then. He told me he was about to go to Bali. I said, “I have a good friend who’s an architect who lives in Bali, and he’d love to meet you and show you around.” So I put them in touch. And Gideon came back, effusive over the treatment he’d been given and what he had seen. He was so grateful, because it really made his trip to Bali. He said, if there’s anything I can do for you – mmm, here we go – do let me know. I said, Gideon, I would like it if you could give me a rehearsal studio so I can perform for John Cage. He says, I’ll give you the Juilliard Theater. This was in the summer. He gave us the Juilliard Theater. And there I was with Marion performing in this huge Juilliard Theater with just Cage in the audience. That was the beginning of a long and beautiful friendship, as they say. MLT: He fell in love with us. He wrote us a mesostic, which is a poem, on our names. The following year was his 70th birthday and Symphony Space organized Wall-to-Wall John Cage. He invited me to open it with him. He really liked the way I prepared the piano and the way I dedicated myself. He recognized something in my Asian sensibilities that he liked. That was the beginning of this really long and intense collaboration and friendship – 1981 until his death in 1992. That’s why Lincoln Center asked me to do the memorial tribute. There you have it. Once I discovered the inside of the piano, once I raised the lid and wasn’t afraid to put my hands inside, it was like an oyster that I discovered, with sonic pearls. The whole sonic universe of pearls to be discovered. As I became more and more adept at playing this kind of music, composers started writing for me in this medium. From there, I went on to the toy piano, which is just another extension of the piano. GR: When you give concerts now, do you include many instruments from the big piano to the toy piano? MLT: Usually I give toy piano concerts separately. I can do toy piano concerts even when there’s no piano. That’s why I can perform in galleries; I can perform anywhere. GR: I know what a toy piano is in the toy store. Is yours different? MLT: That’s what it is. It’s a toy piano. GR: There are dampers and hammers? MLT: There are no dampers. A toy piano is just a toy. But there are toy pianos and there are toy pianos. And they come in different sizes: the toddler one is an octave and a half, and then there’s two and a half octaves. The biggest that I perform on is three octaves. And that’s it. You can do a lot with three octaves. GR: No dampers? No pedals? MLT: Nothing. It’s very, very primitive. It’s little plastic hammers attached to piano keys hitting the metal rods. It’s a repackaged xylophone or Glockenspiel pretending to be a piano. GR: What about your technique? MLT: Ah, that’s where you get into a whole other world. You see, it’s so primitive. A real piano has hundreds of moving parts. This is just a plastic hammer attached to a key hitting a metal rod. It doesn’t get any more primitive than that. I have learned to control it, to make these variations in touch and articulation and dynamics because it’s so primitive that it takes an incredible amount of fingertip sensitivity and control, far more than on a big piano. As a result, you go back to the big piano, and then you find you can do the six levels of PPPPPPP that George Crumb requires, and make a distinction between that and four Ps, and three Ps, and you can do it reliably. It’s so much easier after you’ve practiced on the toy piano. It’s a dream. The bottom line is, it’s made me a better pianist on the adult piano, as a result of all the hard work I’ve done on the toy piano. What a bonus. When I gave a lecture to the doctoral piano student class at Juilliard on toy pianos, I gave them this parting advice: If you ever get a chance to practice on a toy piano, take it, because it will do wonders for your adult piano playing. That was my parting shot to them. GR: Can you play legato? MLT: Well, yes, you can play legato on the keys. But the legato is an illusion, because the toy piano sound has a very steep decay. On the other hand, there is this aura, this blossoming of the overtones. It’s a funny paradox. It’s a blossoming of the overtones, but the fundamental decays very quickly. You can create the illusion of legato – at least I can – but that’s the same thing with the piano too, isn’t it? One creates the illusion of legato. Except the delay is longer there than on a toy piano. I have found, through sheer hard work and determination, that it is possible to create a relative range of dynamics. Today, my proud boast is that anything I can do on the adult piano, I can do on the toy piano. Which is saying a lot. I wouldn’t try the Rachmaninoff Third Piano Concertoon it. But then I have my own concertos for toy piano, thank you. The Schoenhut toy pianos that I have are three octaves. I tour with the 37-key Schoenhut. Schoenhut is the name that’s synonymous with the toy piano, because Albert Schoenhut invented the toy piano back in the 1860s. It stayed in this one family – can you believe it – till 1984. Over 100 years. He had five or six sons, and it was a family business in Philadelphia until the factory closed its doors. They’re beautifully tuned, and have a real workable key action that you can actually play. The toy piano was meant as an educational toy, for children to learn. The keys are more or less adult size. They’re foreshortened, but the width is adult size. A child could learn on a toy piano and transfer to an adult piano without a great deal of difficulty. Schoenhut went into a lot of other toys besides toy piano. They made percussion instruments, and roly-poly dolls and all kinds of train sets. In fact, Schoenhut toys are very collectible. The Schoenhut company still exists today. It’s no longer in the Schoenhut family. But the name persists. The current ones are made in China. GR: How do you travel with your instruments? MLT: They go in professionally made crates. The crate’s about 35 pounds with the piano in it. The crates cost a lot, like $400 a crate. GR: Do you sit differently? MLT: I sit at the toy piano on an eight-inch-high stool. At a recent concert at Spectrum Gallery, I sat for some part of the concert on my little stool, and also I sat on the piano bench. At Spectrum, the stage is low and nobody would see me. I had platforms, which I brought to the theater from another show that I did. Thank god I didn’t throw the platforms out. I used them and gifted them to Spectrum. MLT: I sit sidesaddle. That’s comfortable for me. GR: When I play a real piano, I need power. I use my arms, which are supported by the rest of my body. MLT: I can play violently. I’m very strong. GR: Sitting in that position, you don’t have full use of your body weight. MLT: My spine is aligned. My pelvic region is stoically balanced. GR: The first composer to take a toy piano seriously was John Cage. Is that correct? MLT: Yes. Yes. And then George Crumb in 1970, in his Ancient Voices of Children. He included half a toy piano. GR: What was your first album? MLT: My first toy piano album was called The Art of the Toy Piano, and it was on Philip Glass’s label, in 1997. There was so much excitement and buzz about it, I couldn’t believe it. It got on everything, from CNN to All Things Considered on NPR. Even into Newsweek magazine. Can you imagine? I think the reason why is because here was this really charming and delightful music, and it was not a gimmick. In these twenty years, nobody has ever, ever accused me of promoting a gimmick. Since I’m serious about it, people also take it seriously. GR: Who were the composers? MLT: There were arrangements that I had made of Philip Glass. At the beginning I made arrangements because I didn’t have much repertoire. Philip Glass’s Modern Love Waltz sounds every bit as good if not better on the toy piano. That’s why he agreed to have it on the album. Then I did the Moonlight Sonata on toy piano. It sounds like from outer space. They wanted something that would really sell the album. Toby Twining made me a lovely arrangement of Eleanor Rigby by the Beatles. Then there was a whole bunch of commissioned works from the Bang on a Canners, Julia Wolfe and David Lang, who have both since won Pulitzer Prizes. Toby Twining wrote me two gorgeous pieces that combined toy piano and the regular piano, and those were the first-ever pieces to be written for that magical combination. Some of these pieces were fiendishly difficult. I really had to practice. Julia Wolfe’s piece was incredibly virtuosic. It was called East Broadway because it had the frenzy and the bustle of Chinatown and East Broadway. It had a techno track to go with it that I had to stay with, using a click track. It was complicated. That is what really launched my toy piano career. I started getting invited to international festivals, taking my toy pianos around the world. Ever since then, I’ve really found it a very interesting challenge to maintain this over a period of time. But other pianists are interested – my dear friend and colleague Phyllis Chen started the Uncaged Toy Piano competition for scores and an Uncaged Toy Piano festival every two years. Now there’s an even larger repertoire for it. There are several pianists in Europe who’ve also become very keen on the toy piano. John Cage must be smiling from up there, and saying, in his wonderfully inimitable voice with a twinkle in his eye, “Isn’t that wonderful?” The irony is, I did not have a toy piano when I was a child. I probably would have pooh-poohed it. Sometimes I look back at the days when I was a classical pianist and think, how on earth did I get myself into this new situation? When I give a concert, it’s no longer just walking in there and playing. I have to set up as if it’s a theater production, and it’s huge. Even for the simplest setup. For example, for the performance I just did at Spectrum there was five hours of nonstop setup, without a minute to drink, eat or pee. That’s how intense it was. It’s more than just giving a recital. There are so many details to be taken care of for the show to go smoothly. Notice I said “show,” I didn’t say “concert.” There’s zillions of little finicky details and you have to be sure that everything is in place. You also have to take care of the lighting and the amplification. It’s like a theater production every performance. GR: Can you play in a large hall? MLT: I do, with amplification. I can do a 500, 600-seat hall very comfortably, with amplification. I’m beginning to think I need to travel with a tech director rather than starting from scratch in each place. I usually tour with two crates, the two toy pianos, a grand and an upright, and a whole suitcase full of toy instruments. GR: Who are your audiences and how do they respond? MLT: They’re young people. They’re sometimes classical people, and sometimes they’re old people who want to trip down Memory Lane. Whoever they are, they’re always enchanted. I love it when you have people come to you with a smile afterwards and they’ve forgotten their cares and the concerns of the everyday world for those two hours. I just want to be an entertainer. That’s all I want to do, is entertain people. Also it’s an insidious way of introducing them to avant-garde music. They wouldn’t necessarily go to a concert of new music, but going to hear the toy piano, they’re being introduced to this entire new avant-garde repertoire, and then they come to me afterwards and say, I really love avant-garde music. And I say, mission accomplished. MLT: I’m on the verge of composing. I’m very good when composers give me a structure within which to be creative. Cage did that. Within that framework, I’m really good. I have never quite had the confidence to make that final move, to step out and create something from scratch. When I was at Juilliard, in those days there wasn’t anybody ready to teach you how to play Crumb or Cage. Nobody wanted you to play inside the piano. There was a piano teacher at Juilliard who was a dear, dear friend of mine until I started playing prepared piano, and then he just cut me off. He disowned me. So there was nobody to teach me how to do all these things. GR: You found your way. MLT: I found my way, and you know why? A, because I was determined. B, if you read the instructions of Crumb and Cage at the beginning of each score, it is so clearly explained. You may need to read it three times, four times, take the time. Everything is there in the instructions. That’s how I figured it out. I learned to read the score as a blueprint. You have to be your own teacher, and the score became my teacher. GR: That’s the way I feel about playing Bach and Brahms. And Mozart as well. MLT: Sometimes younger composers write for me – say, someone like Tan Dun, the Chinese composer, who wrote a very interesting piece inside the piano. It was very Chinese, with all these techniques that conjured up images of the pipa or the guqin. He was around, so he could explain to me the things he wanted. His score and his introductory notes are not as clearly explained as Cage or Crumb. I think if I were coming to it without his assistance, I would have trouble understanding him. Notation and explanation of symbols is a prerogative that has to be seriously studied, and presented by the composer, if you want anybody to play your music after you’re dead and gone This past year I didn’t play a single toy piano concert, because I was totally focused on performing George Crumb’s Metamorphosis, this major new piano cycle that he’s embarked on, in which Book One has been written for me. This was a major undertaking; it’s 45 minutes long. I did the world premiere at the National Gallery in Washington. And I just did the New York premiere last month in the Ecstatic Music Festival in Merkin Hall. And then I did several European premieres. GR: How long does it take you to learn a piece like that? MLT: That was a full-time occupation for one year. Crumb would give me the piece of music. I’d come back a month later, having learned it, and I would play it for him on his Steinway M, which took me a day of adjustment because the M interior is completely different from my Steinway B or a concert grand D. I would learn the piece and bring it back to him a month later. And the deal was I’d play for him and he’d make any changes. We would discuss things. He was very open to suggestions. And then he’d deliver me the next movement. This went on for a year and a half. Then it was done. For me a meaningful process, a great privilege really. Because this is the first major piano cycle that George Crumb has embarked on since his groundbreaking Metamorphosis forty years ago. Now he’s on to Book Two. You have to know the piano you’re playing. If it’s a Steinway D it’s not a problem because I know that like the back of my hand. But I cannot play on a Yamaha, and I cannot play on a Bosendorfer because they are too strutted up inside and I can’t maneuver freely. That’s why I always have to stipulate that it be a Steinway D concert grand. The first time, it was such a rude awakening. I had learned George Crumb’s Five Pieces for Piano, whichis incredibly difficult. That was the first piece I learned by Crumb. I was invited to a George Crumb festival, in Connecticut; Crumb was going to be there. And to my horror, I got there the day before and realized that the crossbeam intersection on a nine-foot concert grand was not the same as my Steinway B, seven-foot, at home. And I had to rework my whole choreography to be on this side of the beam instead of the other side of the beam. It’s like trying to relearn a dancer’s choreography within a span of twenty-four hours. It was a nightmare. It recalls to me the recurring dream that Nureyev used to have about being onstage in his street shoes. Especially since George Crumb was going to be there. Oh. That was a really, really stressful occasion for me. GR: What are your future plans? MLT: I see my work going more and more in the direction of theater. My concerts are no longer just plain old-fashioned concerts. They are really theater productions. My work now involves props, multimedia, acting, vocalizing. I think that my next project will be definitely a music-theater, multimedia production. That is already starting to take shape. I’m creating a full-length evening, Sonic Memoir, of my life.Three Australian festivals and festivals in Asia expressed interest. GR: How do you envision your legacy? MLT: After I’m dead and gone, I have no fear that there will be other young pianists taking up the siren call of the toy piano, and there’s a repertoire for it. No doubt there will be a continuously growing repertoire for it as more and more young people become interested to take it on as a real instrument. I’m very proud to say that the toy piano will be my legacy. And maybe there will come the day when Juilliard has a toy piano department. I want to be chairman of the toy piano department. 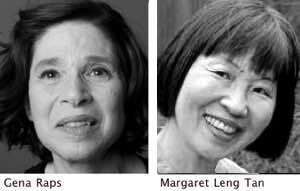 Margaret Leng Tan was born in Singapore in 1945. At the age of six she began studying the piano. After winning competitions in her home country, she earned a scholarship to study at the Juilliard School in New York City where she studied with Irwin Freundlich. Ms Tan has performed internationally and is best known for her performances of avant-garde music on the prepared piano and the toy piano. She has inspired composers to write for her, integrating Asian sounds and instruments with Western classical forms. She lives in Brooklyn with her four dogs. Gena Raps’ performances and recordings, particularly of Dvorak and Mozart for Arabesque and Naxos, have received international praise, “building with quiet majesty” (NY Times). Raps recorded the complete Mozart 4-hand repertoire with Artur Balsam and Mozart at 8 with Carol Wincenc for Naxos. She created and produced the CDs Play Bach! and Mother Goose and More with Julie Andrews and Peter Schickele. She was featured on the PBS series, “Women Alive!” Raps’ new recording of the late piano works of Brahms was released in the spring. She has toured internationally and has taught at the Juilliard School, Sarah Lawrence College and is on the faculty of the Mannes College of Music. View More: Next piece "Crape Myrtle", Home, Archive. What a wonderful interview with a remarkable musician. Thank you for emailing the fall issue. What a treat to find this interview with delightful examples. Love it. MLT is remarkable!! Glad you enjoyed! !